I am participating in Blogging Through the Book: The Gospel of Yes by Pastor Mike Glenn. This series was birthed by Dana Pittman, who is an amazing writer and speaker. I am honored to be partnering with her and her amazing team of writers. Every Wednesday we will be blogging our thoughts and insights from this book. 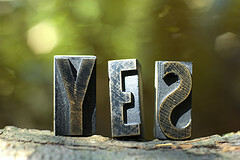 It’s not quite a ‘yes’ as the ‘s’ is backwards. All my life, I’ve been saying ‘yes’ to everyone, but myself. I’ve spent years helping, encouraging and supporting everyone elses’ dream and vision, except my own. I actually derive pleasure by encouraging others. However, it’s a whole other story when it has to do with my dreams. For years, I’ve always watched from the sidelines while others pursued their dream and lived their calling. The Lord wants me to move me away from being a spectator to becoming a participator. God has been challenging me in this area. He wants me to say “yes” to His calling. However, I always shrink back in fear. My biggest stumbling block is fear. Fear of failure, fear of not being good enough, fear of disapproval… the list goes on. Even writing this post is difficult. I have to battle my way through what feels like a flood of voices coming against me. I seem to be saying ‘yes’ with my lips, but not with my life. I wonder how long or what it’s going to take for me to surrender, overcome the fear and say ‘yes’. I recall being in the zone a couple times in my life. Once while doing aerobics and another time while singing. I had this heightened sense of awareness and everything just flowed. I wonder what it would be like living in the zone every day? As I continue to read and blog, The Gospel of Yes, my prayer is that the Lord helps me get in the zone. What about you? Have you said ‘yes’ to God? Are you living in the zone? 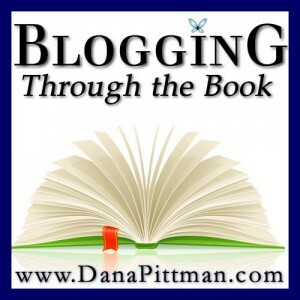 Blogging Through the Book is a group of bloggers who literally blog while reading the book. It’s different than merely reading a book and posting a review. We have a chance to read and share our thoughts in community. To learn more visit www.danapittman.com. I am pleased to introduce Dayna Renee Hackett Bickham who is guest posting today. I met Dayna through the Michael Hyatt Platform Book Launch Team. I have been following her blog, A Year in the Spiritual Life for some time now. Dayna is a great writer and a spirit-filled, godly woman who I am blessed to know. Please follow her blog or on Twitter and Facebook. I have always loved writing in all its forms. When I was a child a pencil and paper were two of my favorite things. I would look at a blank page as a challenge and my mind would kick into overdrive to come up with a creative way to fill it up. I am made in my Father’s image. He “page” is the tablet of men’s (and women’s) hearts. I am His pencil. Each of us is designed by God with a purpose in mind. Our everyday, walking around, take the kids to the mall, change that diaper on the fly, make dinner and look fabulous while you do, lives are not our own to live. We are made to live for our Father: to show His love to others. We were made to write on the tablets of people’s hearts the love of Christ and awaken in them the desire to love God in return. God is a Master Maker. He made the universe, all the galaxies, and you and me. Like the psalmist David, I have looked at the stars and asked “who am I, that you are mindful of me”? You are an ordinary servant with an extraordinary gift to give the world. God made you for a reason. I cannot reach inner city kids, but one of you can. You are that pencil. I cannot minister to men in prison, but one of you can. YOU are that pencil. I cannot preach on distant shores, but one of you can. YOU are THAT pencil. There are diverse gifts and callings. Not all of us can do everything. When you find that thing God made you for, then you will know just how extraordinary His plan is for you. You are an ordinary servant with an extraordinary gift. 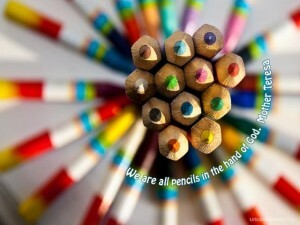 You are a pencil in the Hand of God. Are you allowing Him to use you? Are you sharp and up for the task? Are you willing to own your mistakes before people and bask in God’s grace when He erases your sin? You are a pencil in the Hand of a Master Maker, what better way to create a beautiful work of art in this world than to be used by God? What is one way you can write on someone’s heart today? Wrecked is about the life we are afraid to live. It’s about radical sacrifice and selfless service–how we find purpose in the midst of pain. It’s a look at how we discover fulfillment in the least likely of places. It’s about living like we mean it. It’s a guide to growing up and giving your life away, helping you live in the tension between the next adventure and the daily mundane. This book is for us–a generation intent on pursuing our life’s work in a way that leaves us without regrets. Author Jeff Goins shares his own experience of struggling as a missionary and 20-something who understands the call to live radically while dealing with the everyday responsibilities of life. Wrecked is a manifesto for a generation dissatisfied with the status quo and wanting to make a difference. I have been following Jeff Goins’ blog for some time now. I read everything he writes. He is one of those remarkable people you meet in life. Everything this man writes is gold. He is wise beyond his years. He continually blesses me with his blog posts and now he completely Wrecked me. I don’t even know where to start. How do I put into words my experience reading this book? Every single page of this book is phenomenal, truly. Wrecked will make you see the world differently. Wrecked will convict you. 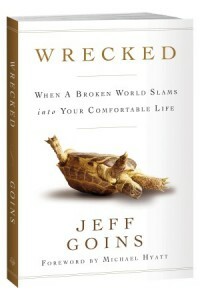 Wrecked will not make you feel comfortable. Wrecked will challenge your complacency. Wrecked will propel you into action. When we think of the word “missionary”, we envision countries like Africa, India or Guatemala. However, these countries aren’t the only places that need our help. Wrecked discusses serving and making a difference where you live. We do not need to travel thousands of miles away to serve others in need. We can choose to serve right in our own communities. I admit, I was one of those people who thought I needed to go to some far off land to make a difference. There was a lot of romanticism connected in being a missionary overseas. Yet, the Lord wasn’t asking me to go anywhere. I had it in my head that this is what He wanted me to do. I figured if I sacrificed going to another country like Africa and serve as a missionary, I would finally arrive in becoming this great Christian. Nothing could be further from the truth. There was a part in the book which especially spoke to my situation. I had this “dream” of becoming a missionary in Africa. The whole idea became bigger than life to me. God had other plans for me though. I met my husband, got married and had two boys. I remember when I had my first son, he was diagnosed with all sorts of health issues. I realized then my dream of becoming a great missionary in Africa was over. I really was struggling in my new role as wife and mother. I had a difficult time understanding why my son was born with all sorts of health problems. I didn’t understand what the Lord was doing and questioned Him a lot. I wasn’t a happy camper. Well, that pretty much sums it up. I came to realize this after the Lord broke me of my idol. Funny thing is, I was exactly where God wanted me to be all along. I highly recommend Wrecked to everyone. This book will change your life. If you order the book through August 4th, Jeff Goins will send you six exclusive gifts valued at over $158. Please check out what you will get here. In conclusion, I want to personally thank Jeff Goins and Moody Publishers for allowing me the opportunity to read and review an advanced copy of this book. I am sincerely grateful. Remember Me is the third of a trilogy of books focusing on the character of William de Bulmer, his conversion of life and heart, and the flowering of his ability to love. After the brothers of St. Alcuin take William into the abbey (in the Hardest Thing to Do), he falls in love with Abbot John’s sister (in The Hour Before Dawn), and now has accidentally lost all of the abbey’s money. Seasoned author Penelope Wilcock unlocks the story of one man’s struggles, mistakes, and heart’s longings, and traces the possibility of what it means to get things wrong and begin again. As with each novel in series, the reader is encouraged to explore a universal aspect of the Christian faith–in this case, the cost of allowing God to do what is necessary to make one whole. I must admit, I don’t usually read books like Remember Me, but I was delightfully surprised. What a gem of a book! Penelope Wilcock is a wordsmith. She writes beautifully and descriptively. I was able to envision the various characters and feel everything they felt. My favorite character was William de Bulmer. I felt compassion and sympathized with him a great deal. I was able to put myself in his shoes and identify with his dilemma. He was vexed in spirit and seemed to have come from an abusive past which haunted him. He was also in love which just added to his inner struggle, turmoil and guilt. I was experienced a gamut of emotions while reading this book. Remember Me made me think deeply and reflect on my own life. How many times have I failed and been judged ruthlessly by others? Remember Me is about love, loss, regret, forgiveness and redemption. I highly recommend this book to young adults and adults alike. In conclusion, I would like to thank Bonnie S. Calhoun and Crossway for the opportunity to read and review an advanced copy of this wonderful book. I’d like to introduce Heidi Kreider. She is a dear friend and my first guest to post on my new blog. I am so grateful to God to have crossed paths with her on the Michael Hyatt Platform Team and become friends. She is a gifted writer and godly woman. She authored a wonderful book called The Secret of Counting Gifts which she will be talking more about below. A wise one once said, “the years reveal what the days cannot see.” In my insecurity, God was already at work. He had the next step of my life planned. He brought to fruition a life long dream of mine, to be an author. There was never enough time in a day to pursue any serious writing… until my life course changed direction. My God works that way, often in ways that I only recognize in hindsight. 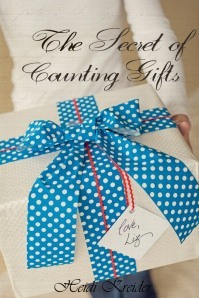 The Secret of Counting Gifts is a story about life, friendship, hardship, and gratitude. It is the story of Kris McClintock and Liz Bower and their friendship that spans twenty-eight years. Through marriage, babies, and infidelity they stand by each other and hold one another up… until breast cancer delivers the final blow. As she sits by Liz, Kris recounts the trials and blessings that made them who they are. She tells their story and recalls the many “gifts” they have been blessed with throughout the years. She shares of how Liz taught her to notice the gifts in each day and to live with a grateful heart. It is through the telling of their story that the secret of counting gifts is discovered…. I look forward to seeing how God will use this next step in my life. Throughout this month, I am on a virtual book tour. You can see the stops along the way at www.heidikreider.com. Come on over and say “Hey!” and register for my giveaway… autographed copies of The Secret of Counting Gifts and The Secret of Counting Gifts Gratitude Journal in a hand-made basket. I’d love to chat. How has your life direction changed? What is your next step? **Heidi Kreider is a wife, mother, author, and friend. 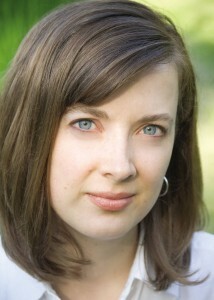 She blogs about life, grace, and gratitude at www.heidikreider.com. Many of us would love to read the Bible more often, but we rarely make time for more than a few verses on the run. But the Bible was never meant to be read in short segments here and there when you can fit it in. The Bible is meant to be experienced in sizable chunks–in passages–and read daily. It is not a book of mystical incantations, but the story of God’s passionate love–for you. It is not a distant relic, but a best friend offering counsel and companionship–for today. Through his own remarkable story, Brian Hardin shows you how reading through the Bible in a year changed his life and how it will change yours too. Passages goes beyond exploring how the Bible was meant to be read, providing three distinct Bible reading plans to help you get started doing it right now. Hardin, whose daily podcasts has more than a million listeners a month, guarantees you a life revolution, if you will only commit to a few minutes a day to read through the Bible in a year. As you rediscover the joy of reading the Bible, visit www.dailyaudiobible.com and join a community of fellow readers to share your thoughts on your new adventure. I read Passages in two days. As soon as I read the description, I was hooked. I can’t tell you what an incredible book this is. 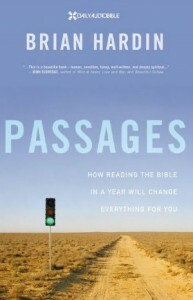 I have read many books on this subject, but Passages is in a league by itself. Brian Hardin begins by explaining how he came to read the bible everyday. He gives his testimony in Chapter One entitled “The Olive Couch”. Chapter Two talks about the reasons why we don’t read our bible. This was one of my favorite chapters. Our number one excuse for not reading our bible is lack of time..
Can you relate? I know I can because I struggle with this myself. The other is understandability which Brian Hardin discusses as well. Chapter Six was extremely interesting for me. The chapter discusses “Lectio Divina: Divine Reading”. Brian Hardin also writes that reading the Word of God out loud has remarkable power and authority. I admit, I never read the Bible out loud to myself. However, after reading this book, I will now apply this new practice to my daily bible reading. Brian Hardin has a unique, creative and eloquent writing style. Passages inspired me so much. I am now listening to his daily podcasts and also joined Daily Audio Bible online community. If you struggle with reading the Bible, I highly recommend this book. Passages is full of wisdom and inspiration. I especially loved reading people’s testimonies throughout the book. In conclusion, I want to thank Brian Hardin for writing this book. I also want to thank Litfuse Publicity and Zondervan Publishers for sending me a complimentary copy of this book to read and review. 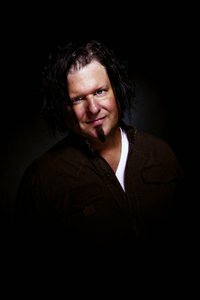 Brian Hardin is a speaker, photographer, record producer, and an ordained minister. In 2006, he created the Daily Audio Bible, an online podcast that now delivers 1.5 million downloads a month. He has produced over 150 albums and works with artists and the arts extensively. He is married to Christian musician Jill Parr. I have had the blessing of traveling a great deal in the past. I visited several countries and have seen poverty at it’s worst. 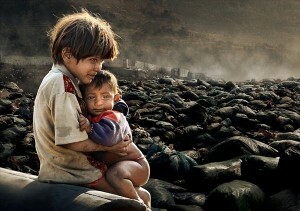 Nothing breaks my heart more than witnessing homeless and hungry children, especially orphans. This photo speaks a multitude, doesn’t it? This world can be such a cruel place. How I wish something could been done to help save every child and preserve their innocence. There are times I feel helpless and overwhelmed, like tonight for instance. I was walking crosstown on 42nd Street to catch my bus home. As I was walking, I took in my surroundings; the rhythm, activity and energy of rush hour. Until something caught my eye that caused me to stop in my tracks. I remained frozen, watching, pondering whether I should go do something. This moment reminded me of an incident I read in Jeff Goins’ new book, Wrecked. I knew I had to make a choice. Suddenly a man spoke and snapped me out of my trance. I guess he noticed my struggle. He tells me, “Your heart strings are being tugged, huh?” I said, “Yes.” He nodded in understanding. Right then, I decided to walk over to her. This young woman who was pregnant sitting on the hot concrete floor with a toddler. She must have been no more than twenty-five years old. I asked her if she needed help. She didn’t speak English. She said something which sounded like Spanish. However, when she responded again, I realized it wasn’t Spanish, but more like Portuguese or Italian. She wanted me to give her money. I told her I didn’t want to give her money. She said she needed diapers. I said I would go buy her diapers if she wanted. She agreed for me to get her diapers. I asked, what size, she tells me size four. For the life of me, I don’t know how we were able to understand each other, it had to have been the Holy Spirit. She tells me she would wait for me in the same spot for only twenty minutes. So I take off in a hurry to the nearest place I could find and bought diapers. I also bought her a few other items so she could feed her child who looked dirty, hungry and tired. I especially felt compassion for her child. The city was so hot. I’m sure this poor child was outside all day in the heat while her mother begged. When I returned she was there waiting. I handed her the bag and she thanked me. What was most beautiful to me was the reaction on the little girl’s face. She pointed to the bottle of water and looked up at me with a big smile. She seemed genuinely appreciative. I grabbed her little hand and smiled at her too. My heart swelled with love for that child. I so badly wanted to protect her. I looked into the pregnant mother’s eyes and told her Jesus loved her. I also told her to be careful and to take good care of herself and the baby. I just hope she really understood what I said. I arrived home very somber. I began thinking about all the homeless mothers and children living in the streets of New York City and around the world. My heart hurts for them. This tug never goes away. I guess it serves as reminder to never forget. I wonder how things would be if every Christian from around the world stopped to help and encourage one person each day? What do you think would happen? I would be very interested in hearing your thoughts. I barely made it out of bed alive this morning. Ok, maybe I’m exaggerating a little bit. But seriously, I am dead tired and it’s all Jeff Goins fault. It’s his fault because I couldn’t stop reading his new book last night. I literally had to peel myself away and get some sleep. Thus, I rolled out of bed, as we say in New York City, mad tired. I began my daily routine by turning on the water to take a shower. Guess what, there was no hot water… again. Needless to say, this isn’t what I would call an ideal way to start your day. However, the cold shower definitely jolted me awake. Seriously, you should try it some time. While taking my cold shower, I was thinking of Wrecked. My thoughts brought me back to a time where a group of us from Times Square Church went on a short missions trip to Guatemala. I remember when we first arrived to the mission, it was hot. We all wanted and needed to take a shower. But, there was one little problem, there were no bathrooms or showers. Thankfully, it began to rain. We knew this was our opportunity to take a shower. Now keep in mind, I’m from New York City, ok? I’ve only camped out maybe a few times in my life and poorly at that. I’ve never taken a shower in the middle of nowhere before, much less in the rain. But there I was in the mountains of Guatemala, in the rain, with a bunch of people I didn’t know and a major decision to make. Shower or no shower, is the question. I felt gross, so I decided on the shower. The next dilemma was to figure out how and where? The shower situation definitely took me out of my comfort zone. I basically was forced to use my imagination and pray… a lot. Thankfully, the Lord had mercy on my poor soul and answered quickly. There, hidden in view, was my salvation… a small cascade of water falling off a tin roof. When the water hit my skin, it was as cold as my shower this morning. The only difference is, I actually enjoyed it. This experience definitely wrecked me and so is reading this book. Wrecked is stirring me in a major way. Jeff Goins is a prolific and amazing writer. His writing is like eating your favorite ice cream, you don’t want to stop. But whatever you do, don’t buy the book yet. You don’t want to miss out on this: http://wreckedthebook.com/. 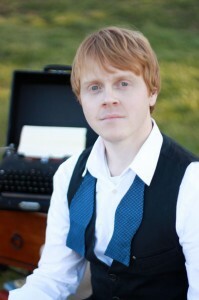 Jeff Goins is a part-time blogger, speaker and author. He works full-time for a nonprofit organization called Adventures in Missions, where he serves as the Communications Director. In his free time, he writes books and shares ideas worth spreading. Originally from the suburbs of Chicago, Jeff graduated from Illinois College with a double major in Spanish and Religion. There, he spent a semester in Spain, which opened his eyes to different cultures and stretched his worldview. After a year of travel and long-distance communication, he moved to Tennessee to chase the woman who became his wife. In 2008, he married her. His blog, GoinsWriter.com, is one of the fastest-growing blogs on the web and is a well-respected resource for bloggers and writers. In 2011, it won the Top 10 Blogs for Writers award on WritetoDone.com. Each month, he receives over 80,000 visitors to his website. Jeff’s work has been published online and offline in a variety of publications, including RELEVANT Magazine (which has a circulation of more than 150,000 readers), Copyblogger.com (voted by Ad Age as one of the top marketing blogs online), and ZenHabits.net (one of Time Magazine’s Top 50 Websites for threes years in a row). At age twenty-one, Andrea Palpant Dilley stripped the Christian fish decal off her car bumper in a symbolic act of departure from her religious childhood. At twenty-three, she left the church and went searching for refuge in the company of men who left her lonely and friends who pushed the boundaries of what she once held sacred. Faith and Other Flat Tires is as unique as its title. The subheading reads, “searching for God on the rough road of doubt”. I have a penchant for memoirs, and this one was especially captivating. Andrea Palpant Dilley was the daughter to Quaker missionaries who served in Kenya most of her childhood. She had grown accustomed to living in Africa, that when she returned to the States, she had difficulty assimilating into the American culture. 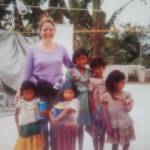 While living in Africa as a child, Andrea Palpant Dilley was exposed to a great deal of suffering and death. Those early experiences planted a seed which then germinated into doubt and her crisis of faith. As we traverse this earth, sooner or later, we will face doubt. We will wrestle, as Jacob did, with an invisible God, we can’t see or touch. Doubt will inevitably be our companion or foe on this sojourn. 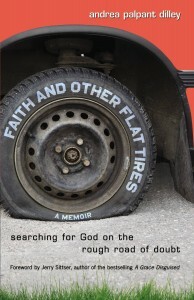 I thoroughly enjoyed reading Faith and Other Flat Tires and highly recommend it to adults who are struggling with faith and doubt. In conclusion, I want to thank Zondervan and Handlebar Marketing for sending me a complimentary copy of this book to read and review. Author Jeff Goins shares his own story of self-doubt and what it took for him to become a professional. He gives you practical tips for freelancing, how to get published in magazines, and what it takes to build a platform that brings the gatekeepers to you. This journey of becoming a writer begins with a simple but important belief: You are a writer; you just need to write. Readers will learn the importance of passion and discipline and how to show up every day to do the work. You Are a Writer is a book that will help you fall back in love with writing and make the connections you need to build your brand as a writer. It’s about living the dream of a life dedicated to words. I have had the pleasure of following Jeff Goins’ blog for over several months now. I was first introduced to his writing through friends on Twitter. I was completely blown away. I’m not exaggerating when I tell you that I love every single thing this man writes. Jeff Goins is an incredibly gifted writer and communicator. He creates what Michael Hyatt calls in his book Platform, a “Wow” experience. Everything Jeff Goins does and writes is remarkable. I have learned so much from him by following his blog and participating in his writing challenges. One of the things I love most about Jeff Goins is his heart. He is kind, generous and a servant, which makes him such a great leader. I am blessed to be a part of his tribe. You Are a Writer is a brilliant book. I started to read it and couldn’t put it down. 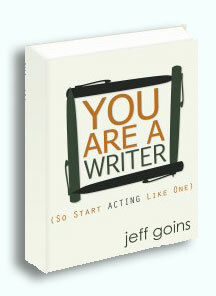 This book goes step by step on how to make “You Are a Writer” a reality in your life. The first step is by confessing, believing, accepting and then acting upon it. The way I did it was by first looking at myself in the mirror and saying to my reflection, “You Are a Writer”. I confess I had to say it more than once to let it sink in. It’s incredible how much resistance I faced with while doing this simple exercise. Those unrelenting negative voices kept trying to convince me otherwise. After I did this, I took it a step further by confessing it to the world on Facebook, Twitter and my co-workers. I was surprised and happy to get a lot positive responses, which was encouraging. If you ever dreamed of being a writer or if you are one and not really pursuing it, I highly recommend this book. You Are a Writer will definitely help, inform, inspire and encourage you!